Yes, it is already that special time of year again. Don’t miss out! 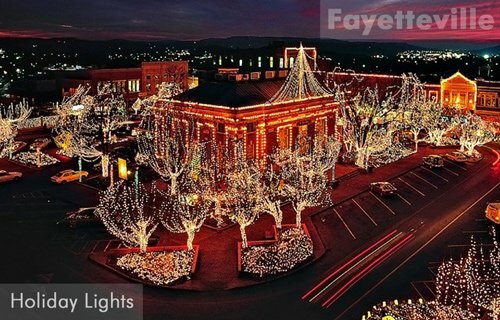 Checkout our list of fun-filled Northwest Arkansas holiday events scheduled from now through New Year’s Eve. Regardless of what you do or where you go, take time to enjoy your loved ones during this wonderful season of joy. Join in the fun and create some wonderful holiday memories. Check back often, we will continuously update this page. Events are listed in chronological order below each city. Description:Lighting Of the Tree at Lawrence Plaza to kick off the Rink Season. 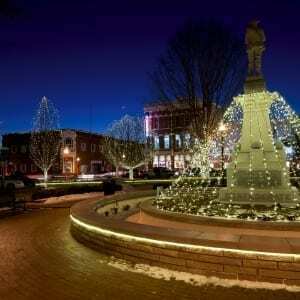 Description: Come enjoy live music, steaming hot chocolate the beautiful lights and celebrate the beginning of the holiday season in downtown Bentonville. Description: Small Business Saturday is the day to celebrate the Shop Small movement which drives shoppers to local merchants across the U.S. in partnership with American Express. Description: Santa Claus will be at the Walmart Museum and ready for pictures with you, your family, and friends. Come down and see us on the square. It’s free! Location: 207 NE 2nd St. Description: Celebration of a new gallery in downtown Bentonville. Join the fun with music, food, drink and an arts showcase highlighting many rising stars of the scene – just in time for the holiday season. Description: Christmas carols sung by the LDS Girls Youth Group. 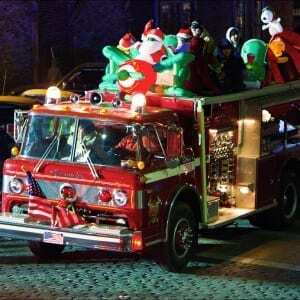 Description: A fun filled Christmas parade that includes floats of all kinds and much more. You can enter a float or just enjoy the show – either way this is a wonderful tradition to share with family & friends! Description: Support your local arts community and enjoy a magical performance of the world’s most well-loved ballet! For more information, click here. Win (2) FREE Tickets to the Nutcracker.. Click HERE. Description: It might be cold outside, but how much fun you will have. Come Bundled up and watch some of your favorite winter classics with the community! Description: Come sing and help usher in the holidays….Spiced Cocoa Cabernet recipe provided by The Spice & Tea Exchange of Bentonville. A true neighborhood event… Carols OLD and NEW… come join the fun…all ages welcome. Description:The APO performs one of the region’s finest Christmas programs, featuring the Ozark Bronze Handbell Ensemble, Arkansas Philharmonic Youth Orchestra and the Choruses of Bentonville Junior High Schools, including a great variety of your holiday favorites! Click Here for more information. Description: The Peel Mansion will be fully decorated for Christmas! Description: Celebrate the New Year through an immersion of art, fantasy, and inspiration set within the breathtaking architecture of Crystal Bridges. Click Here for more information. Description: Santa arrives in Basin Spring Park with Goody bags for children. Description: The Shop Windows Downtown come alive with Elves, Santa, and delightful characters for kids and adults to be surprised! Holiday spirit is in the air as the magic unfolds one shop after the other. 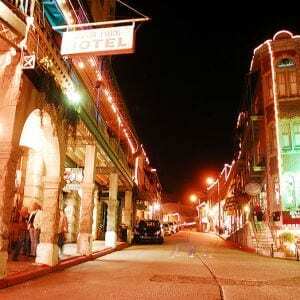 Description: Come and support art and artists of Eureka Springs. Admission is either $3.00 at the door or by a donation of two food items to the Flint Street Food Bank. Time: Saturdays from 10am-6pm, and on Sundays from 11am-5pm. Additional hours on Dec. 21-23 from 5pm-7pm. Description: The largest privately owned Snow Village & Train exhibit in the United States and consists of well over 300 buildings which take you back in time to the 1930’s to 1950’s of small town America. The panorama exhibit includes 3 Lionel 0 scale trains, a Lionel 0 scale trolley, and the Polar Express train. Click Here for more information. Description: Be sure to see this magical winter wonderland of lights on the Downtown Square beginning Friday, November 20th at 6 p.m. with the Lighting Night parade. The lights illuminate the square each evening fom 5 p.m. to 1 a.m. There are nightly carriage and pony rides, fresh hot chocolate and festive holiday music. Click Here for more information. Time: Various Times… click here for specific times. 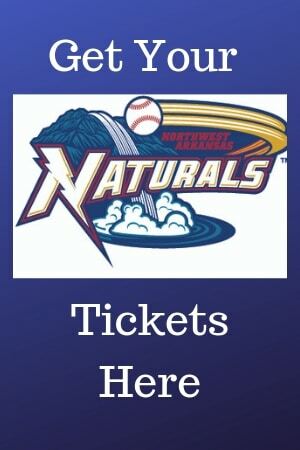 Description: Jaw dropping crafts, local eateries, giveways from vendors, VIP shopping and more. Click Here for more information. Description: Formerly known as the Art Block Sale, this is the oldest running holiday art sale in Northwest Arkansas. It’s known for the exceptional quality and variety of work, ranging from textile, paper and photographic art to award-winning ceramics, watercolors, fiber arts and jewelry. Description: Fantastic train display from the Northwest Arkansas Garden Railway Society and Santa. Description: Various groups singing Christmas carols. Description: A Gathering of Love – Gifting, Gratitude, Thanksgiving and Angels everywhere! Description: A favorite holiday film shown on the silver screen. Description:This exciting performing arts festival is the biggest New Year’s Eve party in Arkansas. Click Here for more information. Time: 10:00 a.m. & 2:00 p.m. Description: Families with children ages 3-12, will have fun watching the Polar Express on the big screen while enjoying cookies & hot cocoa. You can wear your pajamas and visit with Santa before the movie, take home treats, and start a new family tradition! Seating is limited. Click Here for more information. Description: A Christmas Carol for the whole family. Click Here for more information. Location: 28 Springs Banquet Room, 100 E University St. Description: Indulge yourself in homemade cookies & hot cocoa at the Main Street Siloam Springs Christmas Reception. Description: Christmas Parade and First Ornaments of Christmas! Description: Santa and Mrs. Claus share a special breakfast with Sant and Mrs. Claus at the Annual Christmas Parade of the Ozarks. Lots of fun treats planned for children of all ages including a yummy breakfast, a personal visit with Santa, a keepsake photo with Santa, decorating gingerbread cookies with Mrs. Claus, creating special ornaments and more. Click Here for more information. NOTE: Know of an event, not listed? Please contact us and let us know about it.